Are you a student? Check this out! Help with English, Math, healthy lifestyle choices and more! You have been given many gifts... some of which you have yet to realize, including the power of making choices—and making things happen. It is time to take ownership of your powerful mind, your extraordinary body, and your individuality. It is time to celebrate your uniqueness! 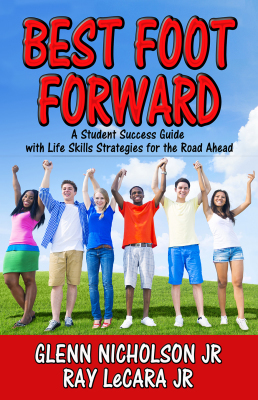 Best Foot Forward is a student success guide broken into three sections: motivation, study skills, and good health. Within those sections, strategies for effective learning and thinking, reducing stress, and maintaining a positive attitude are addressed. You see, the secret to achieving success is learning how to balance your academic life with your personal life. By embracing a passion for life-long learning, self-improvement, and self-discovery, you will make meaningful connections with the world and those around you. Below are online resources to help you in your journey as you pursue those things that set your soul fire.